There are many structures present at the anterior aspect of the ankle. These structures are often susceptible to injury. Common injuries and conditions around the anterior ankle. 1) Anterolateral Impingement. Painful limitation of full range of ankle motion due to soft tissue or bony pathology. Soft tissue thickening commonly seen in athletes with prior trauma that extends into the ankle joint. 2) Arthritis of the ankle joint. It is commonly the result of prior injury or inflammation to the ankle joint. It can usually be diagnosed with an examination and x-ray. 3) Osteochondritis Dissecans of the Talus. 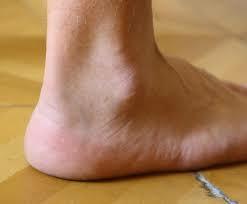 It is chip type fracture that usually occurs with severe ankle sprains. It causes pain, swelling and stiffness of the joint. 4) Tibialis Anterior Tendonitis. It is an overuse condition common in runners. It is a common injury that usually accompanies anterior shin splints. Medications to ease pain, relieve inflammation, slow bone loss, modify the course of an inflammatory disease or prevent joint damage are an important part of treatment for many ankle problems. The medications used to treat arthritis and other problems that affect the ankles will depend largely on the form of arthritis or related condition you have. Nonsteroidal anti inflammatory drugs (NSAIDs) are used to help ease arthritis pain and inflammation. They are used for all forms of arthritis. Corticosteroids: These quick-acting drugs, similar to the cortisone made by your own body, are used to control inflammation. If inflammation is due to a systemic inflammatory disease, doctor may prescribe oral corticosteroids. If inflammation is limited to one or a few joints, doctor may inject a corticosteroid preparation directly into the joint. Disease-modifying anti-rheumatic drugs (DMARDs) are drugs that work slowly to modify the course of inflammatory disease. Different DMARDs may be useful for a number of different forms of arthritis, including rheumatoid arthritis, lupus and psoriatic arthritis, all of which can affect the ankles. Arthroscopic surgery of ankle gives faster recovery owing to less pain and earlier mobilization. Ankle arthroscopy enables the doctor to directly visualize the ankle joint surface. It is performed under general or regional anesthesia. Dr. Raju Easwaran, is the best orthopaedic surgeon in New Delhi. He is very trusted in arthroscopy, joint replacement surgery and all orthopaedic related problem and provides the best ankle pain treatment.